Worked in the round from the top down, Seedstripes is an earflap hat that is full of interest. Disappearing loop cast on, textured knitting and a few simple, well-placed short rows combine for an engaging knit; add a pompom for even more fun! Techniques & Skills Used: disappearing loop CO, knit/purl, short rows, increasing/decreasing. This pattern includes links to my disappearing loop CO and short row tutorials. Size: S (M, L) to fit about 20 (22, 24)” head circumference; hat measures 17.75 (20, 22.25)” circumference and 8.5 (9, 10)” height at earflap. Yarn: Malabrigo Yarn Merino Worsted (100% merino wool; 210 yards/192m/100g); 1 skein, or approximately 140 (150, 175) yards of worsted weight yarn. Sample size Small shown in Natural. Other Materials: US 7 (4.5mm) 16” circular needle or 32” circular needle if using Magic Loop, or size to match gauge; US 5 dpns or circular needle for CO; Stitch markers (4); Yarn needle. Gauge: 18 st and 34 rows/4” in seed stitch, after blocking. See it on Ravelry, to read more or purchase the . . . Perfect as a light layering piece, Patty Ann is a casual, open front vest knit in seed stitch with ribbed edgings. An easy knit from the bottom up, this long vest has gentle shaping at the hip and bust for an attractive fit. A few short rows shape the shoulders, which are joined with a three-needle bind off. Only minimal finishing is required; the front bands are worked at the same time as the body, then extended beyond the shoulders and seamed to the back neck, and the armhole ribbing is picked up and knit to match the ribbed hem. 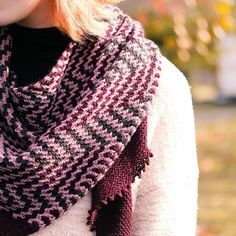 The lean, simple shape is easy to wear, and shows off a pretty yarn with textural stitch patterns. Techniques Used: long-tail CO, knit/purl, increasing/decreasing, picking up stitches, short rows, 3-needle BO. Size: 34 (36, 38, 40, 44, 48)” bust circumference. Patty Ann was designed to be worn open with front edges barely meeting; for a similar fit, choose a size close to your actual bust measurement. 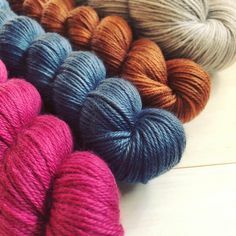 Yarn: Malabrigo Merino Worsted (100% merino wool; 210 yards/100g); . . .